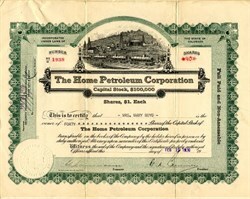 Beautiful certificate from the Home Petroleum Corporation issued in 1920. This historic document was printed by Broun-Green Banknote Company and has an ornate border around it with a vignette of a group of railroad cars passing some oil wells. This item has the signatures of the Company's President and Secretary, Emil C. Steinmann and is over 88 years old. Emil C. Steinmann is one of Denver's well known journalists, publisher of the Colorado Herald, until recently a German publication, but it is being gradually changed into an English print. This paper is well known all over the state among those who speak the German tongue. Mr. Steinmann was born in Berlin. Germany, October 22. 1882, a son of Bruno and Louise (Meschelson) Steinmann. His father came to America in 1872 and engaged in the importing business in New York city for several years, after which he returned to Berlin, where he was married. At a subsequent date he again became a resident of New York city, where he continued in the importing business on an extensive scale. He died in the year 1903. and his widow is still a resident of Denver. Emil C. Steinmann was the only child born of their marriage. In early life he attended school in Berlin. Germany, where he also studied journalism, and he was at one time a student in the University of France. After completing his education in France he returned to New York city, where he entered the employ of the Union Publishing Company. He continued in newspaper work in the east in various capacities until 1909. when he came to Denver and has since been identified with newspaper interests as a representative of the Herald Publishing Company. For several years he was the city editor, afterward was advanced to the position of business manager and later became managing editor, since which time he has had entire charge of the paper in connection with the editorial department. The office has splendid equipment, including the finest presses and most modern machinery, and there is nothing lacking that has to do with a city newspaper office at the present time. The paper has always been published in . the German tongue, but is now being transformed into an English printed paper. Mr. Steinmann is a great political factor in the state of Cojorado, but has always refused public office although official honors have been tendered him at numerous times. He is secretary and treasurer of the Home Petroleum Corporation, a Colorado corporation, operating in the Coffeyville (Kansas) field, and a producing company. On the 12th of October, 1917, in Chicago, Illinois. Mr. Steinmann was married to Miss Hilda Blake, of Chicago, a daughter of Mr. and Mrs. S. F. Blake. In politics Mr. Steinmann maintains an independent course and follows that policy in all his publications. Fraternally he is a Master Mason and he belongs also to the Benevolent Protective Order of Elks, the Colorado Editorial Association and to the Civic and Commercial Association of Denver, taking active interest in all that has to do with the progress, upbuilding and substantial advancement of the city.